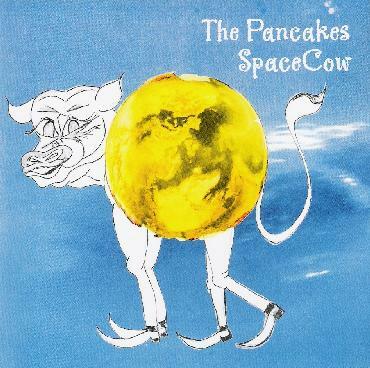 The Pancakes - "Space Cow"
Mixing reverb heavy surf rock with tripped out guitar psych, and a dash of 80's style punk pop, Germany's The Pancakes can sound like everything from the Go-Go's to Syd Barrett era Floyd. The CD gets going with the raunchy surf instrumental Banana, and follows it quickly with one of the more pop oriented efforts on the album, bearing the odd title Uuaah! Daniella Neeff's vocals have attitude to spare, but she can take a sudden turn into softer melodic moments as well. Underneath it all, Rainer Neeff and Russell McSwan pound and crunch away. The track Walking even takes a somewhat Krautrockish rhythm and fills it with squealing guitars and raunchy vocals. The 11-minute Man on the Moon finds the band straying off the map into a stretched out psych/space excursion with groaning guitars and tripped out effects. Borderline is built around a catchy psychedelic pop riff with Daniella stepping back to allow one of the men take the vocal lead. It's quirky as usual. Plus, you have to love Muchachas Arriba, which sounds like a trip to Mexico gone terribly wrong as tremolo drenched fuzz guitar and shimmering effects are interspersed with vocal chants that sound like Speedy Gonzalez on an acid trip. There's a lot going on here. Some of it works better than others, but it's still the kind of music that's fun to listen to. I have not heard the first two albums by The Pancakes, but I have been told this one is light years ahead of those, so if you're a Pancakes fan, you're sure to like this. And if you're not, maybe this album just might make you one. For more information go to: http://www.psychedelic-music.de. Email The Pancakes at: neeffmag@yahoo.com.